This entry was posted in Archives, Genealogy and tagged archives, family history, genealogy, local history, quilts, research. Bookmark the permalink. Best wishes for a wonderful and satisfying presentation. How exciting! Ellen sent this information to my sister Barb, who plans to travel over to see your presentation from Columbus on Friday. I would love to be there, but am not in Ohio. I have always loved and collected the pieces of life that cannot be bought, but happen to pass from family hand to family hand, with a little story that often go with it. 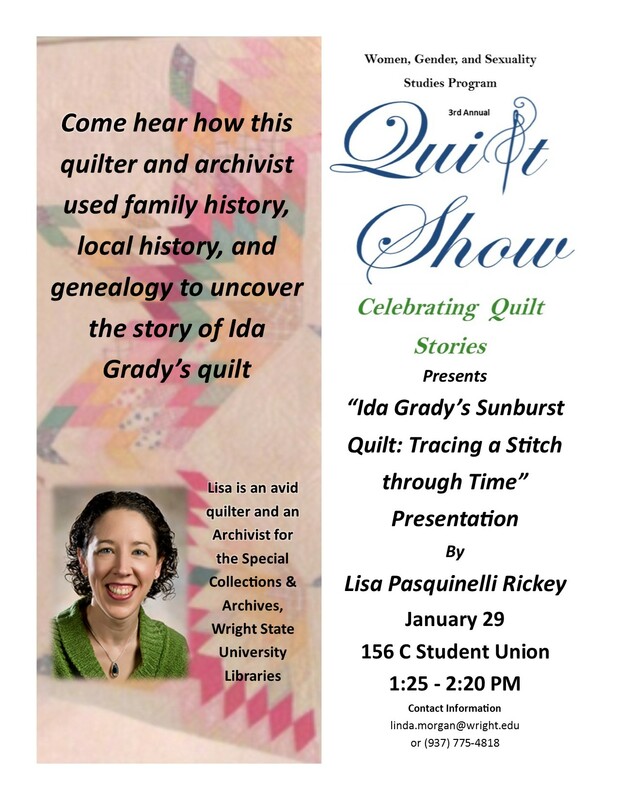 Your story of your “Ida Grady” quilt, is in archival history, from your loving, caring, hands, and a thoughtful mind. Thanks, Aunt Jeannie! And thanks for giving me this quilt and the clue to get me started! Hope your sister can make it 🙂 Love you!